Monster Uni: Post Your Fat Uni Here ! we all enjoy the "Post Your <something> Here !" threads that make some nice galleries. 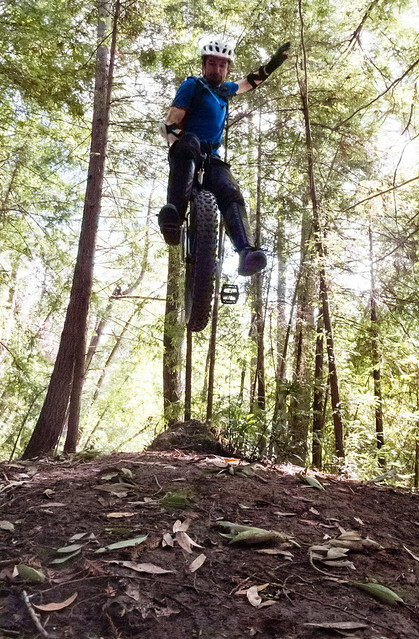 There was a new category of unicycles that are rising now: the Fat unis. Last edited by Siddhartha Valmont; 2014-06-22 at 05:59 PM. This will probably be my favorite thread for a while. Pics to come. 24" Qu-ax MUni, 3.0" Gazza, 145 Qu-ax alu. Does that Surly frame have clearance for a disc break? Here is a lovely shot of my Fat Uni Crew. Creek crossing on my Nimbus Oregon. oooh, a smooth fat tyre, cool! how does that roll? How is that tire?? I've always been curious. What do you use it for? I don't have a fat build - where did you get the idea that I do, or are you confusing me with somebody else? The tire roll on the road quietly and gently, as if you go on the cloud but handling of unicycle monstrously falls because of the huge tire contact patch. For muni! This tire has got me from the previous owner. I want to buy Surly Nate in the future.